The Guardian’s Alastair Dant took the the stage at the News World Summit in Paris today to share the news outlet’s approach to using interactivity to present data and stories to their audience. Dant, who leads the interactive team at the Guardian, said types of interactives include those which plot “paths through space and time”, and those which work to relay “the roar of the crowd”. The Guardian produced two major interactives around the war logs. 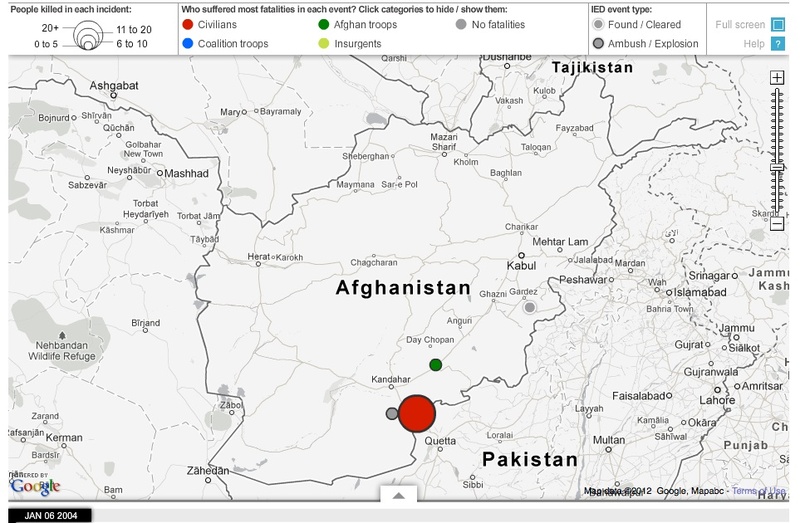 Dant spoke about one which shows all IED attacks on civilians, coalition and Afghan troops from 2004 to 2009 recorded in the war logs. The interactive allows users to “drag the date along the bar, to see where and who they hit over these five years”. The team also produced a graphic showing a selection of 300 “significant incidents” from the logs, linking through to each full log entry. Dant said the team had a “very fuzzy brief” from the editorial team who wanted to “capture the excitement” around the games. 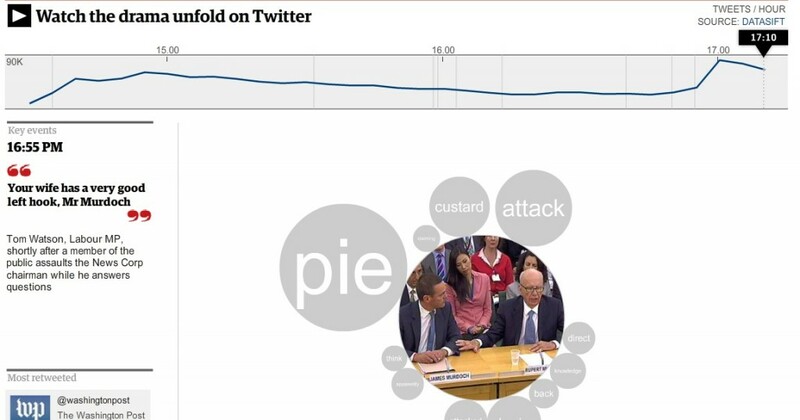 As a result the team produced a “Twitter replay” which consisted of recording all conversations on Twittier and analysing them “to find out how word popularity changes over time”. 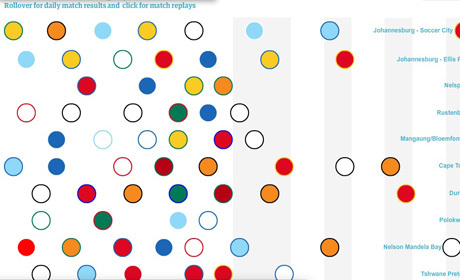 As a result the interative offers 90 minutes of football in 90 seconds, based on Twitter reactions. This entry was posted in Multimedia, Online Journalism and tagged #gen2012, graphics, interactives, social media, visualisations on May 30, 2012 by Rachel Bartlett. The BBC reports its Research & Development department received a Queen’s Award for Enterprise today for its TV sports graphics system Piero. By laying graphics over the TV pictures, Piero gives sports presenters and pundits another way to view and analyse crucial incidents in the games, and explain them more effectively to the audience. According to the broadcaster the Piero system was initially created by BBC R&D and has since been developed and licensed internationally by Red Bee Media, with the award being jointly awarded to both organisations. Piero works by creating a virtual stadium, which is synchronised to the “real” pictures coming from the TV cameras. Pictures of real players are transposed into the virtual stadium, where it is possible to view and analyse the game from different angles in animated sequences. In-game incidents, such as offsides and forward passes can be assessed by pundits from the best angle – even if the play has not been captured at this angle. The system can also render graphics such as distance markings so that they appear tied to the pitch. This entry was posted in Awards, Broadcasting, Editors' pick and tagged Awards, BBC, graphics, sport, visual on April 21, 2011 by Rachel Bartlett. 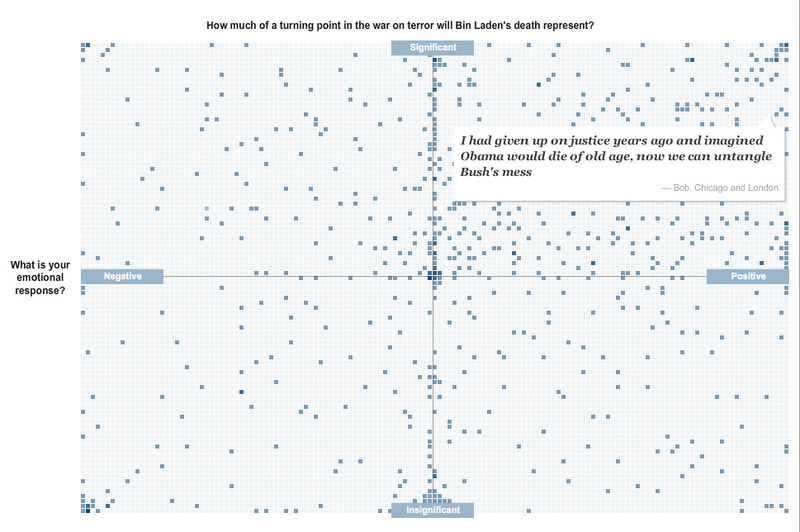 The New York Times has one of the largest, most advanced graphics teams of any national newspaper in the world. Yesterday at the International Journalism Festival, NYT deputy graphics editor Matthew Ericson led an in-depth two-hour workshop on his team’s approach to visualising some of the data that flows through the paper’s stories every day. Here is some of what Ericson told the audience and some of the examples he gave during the session, broken down under the different headers. Graphics should bring something new to the story, not just repeat the information in the lede. Ericson emphasised a graphics team that simply illustrates what the reporter has already told the audience is not doing its job properly. “A graphic can bring together a variety of stories and provide context,” he said, citing his team’s work on the Fukushima nuclear crisis. We would have reporters with information about the health risks, and some who were working on radiation levels, and then population, and we can bring these things together with graphics and show the context. The Fukushima nuclear crisis has spurned a lot of graphics work at news organisations across thew world, and Ericson showed a few different examples of work on the situation to the #ijf11 audience. 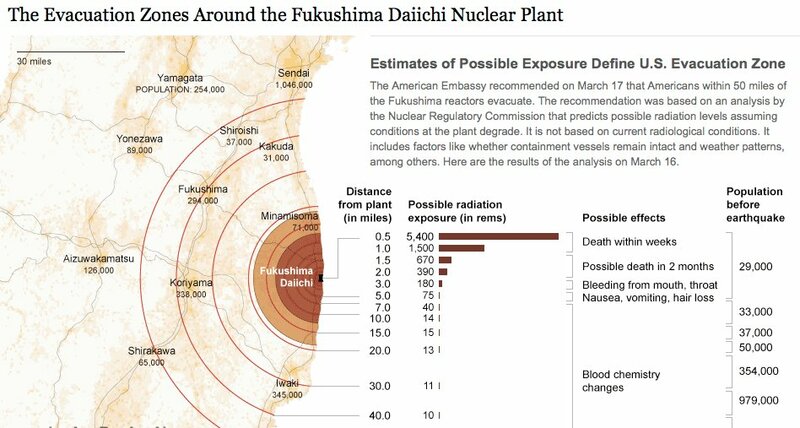 Another graphic demonstrated the process of a nuclear meltdown, and what exactly was happening at the Fukushima plant. 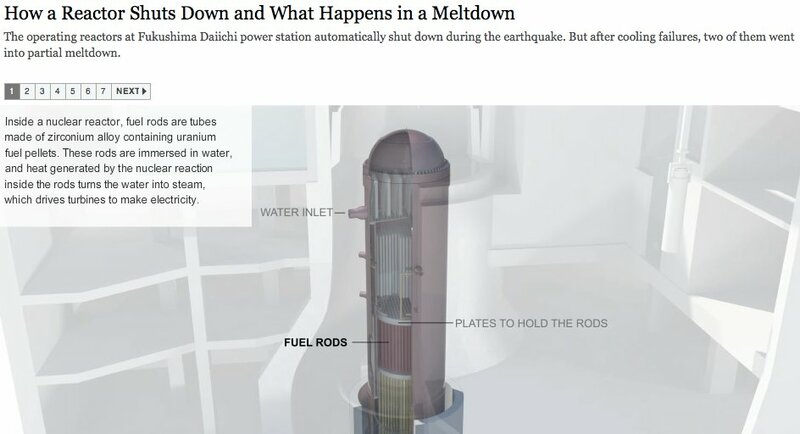 As we approach stories, we are not interested in a graphic showing how a standard nuclear reactor works, we want to show what is particular to a situation and what will help a reader understand this particular new story. Like saying: “You’ve been reading about these fuel rods all over the news, this is what they actually look like and how they work”. From nuclear meltdown to dancing. A very different graphic under the ‘desribe processes’ umbrella neatly demonstrated that graphics work is not just for mapping and data. Disecting a Dance broke down a signature piece by US choreographer Merce Cunningham in order to explain his style. 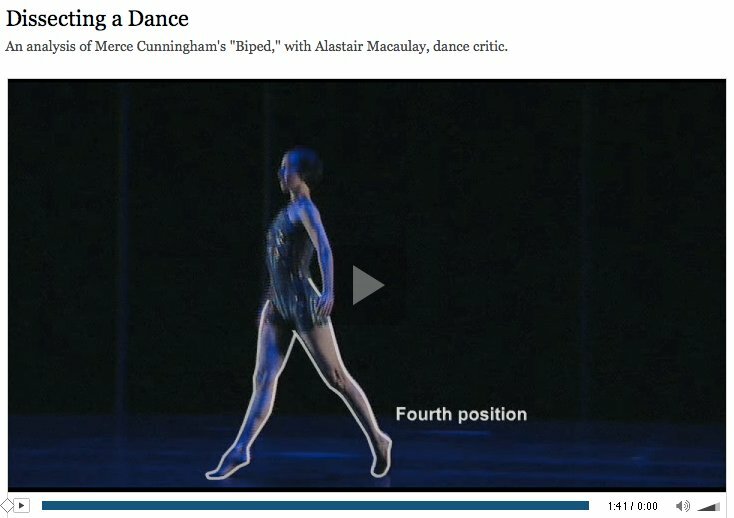 The NYT dance critic narrated the video, over which simple outlines were overlaid at stages to demonstrate what he was saying. See the full video at this link. This is perhaps the objective most associated with data visualisation, taking a dataset and revealing the patterns that may tell us a story: crime is going up here, population density down there, immigration changing over time, etc. 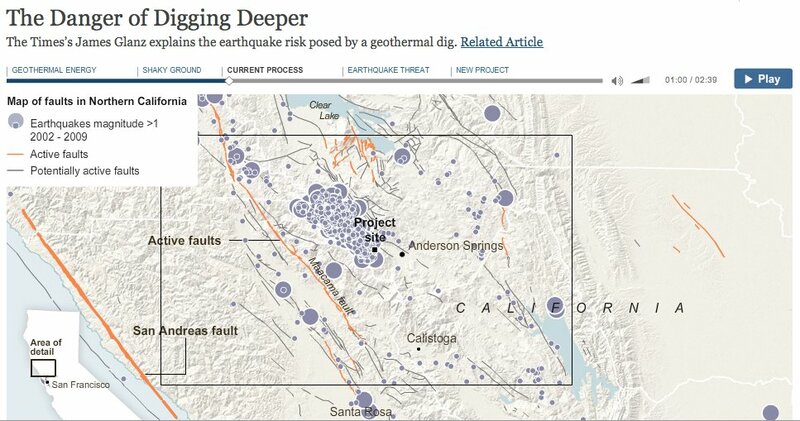 Ericson showed some of the NYT’s work on voting and immigration patterns, but more interesting was a “narrative graphic” that charted the geothermal changes in the bedrock under California created by attempts to exploit energy in hot areas of rock, which can cause earthquakes. These so-called narrative graphics are take what we think of as visualisation close to what we have been seeing for a while in broadcast news bulletins. The final main objective was to show the audience the geographical element of stories. Examples for this section included mapping the flooding of New Orleans following hurricane Katrina, including showing what parts of the region were below sea level and overlaying population density, showing where levies had broken and showing what parts of the land were underwater. 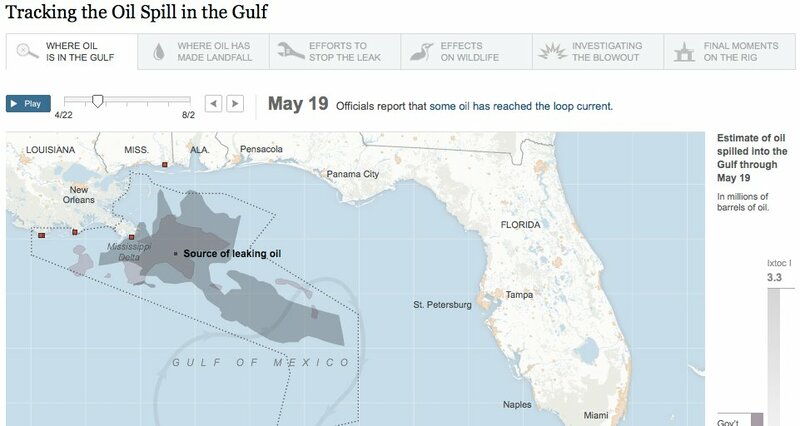 Geography was also a feature of demonstrating the size and position of the oil slick in the Gulf following the BP Deepwater Horizon accident, and comparing it with previous major oil spills. It doesn’t take a skilled mathematician to work that one out. But don’t be fooled by it’s simplicity, it underpinned a key message to take away from the workshop. The message is equally simple: graphics and data teams have the skill to make sense of data for their audience, and throwing a ton of data online without adding analysis and extracting a story is not the right way to go about it. I spoke to Ericson after the session about what kind of people make up his team (it includes cartographers!) and how they go about working on a story. I spoke to Peter Horrocks, who is director of the BBC World Service and the BBC’s global online news operations after the session about his take on data journalism and whether the BBC Global News had ambitions in this direction. See the full list of links for Ericson’s session on his blog. See more from #ijf11 on the Journalism.co.uk Editor’s Blog. 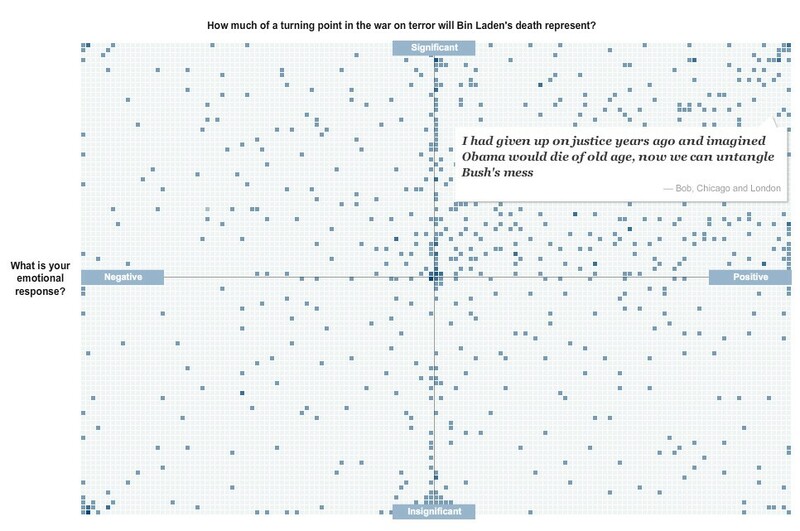 This entry was posted in Data, Investigative journalism, Newspapers, Online Journalism and tagged #ijf11, data, Data journalism, graphics, matthew ericson, New York Times on April 16, 2011 by Joel Gunter.